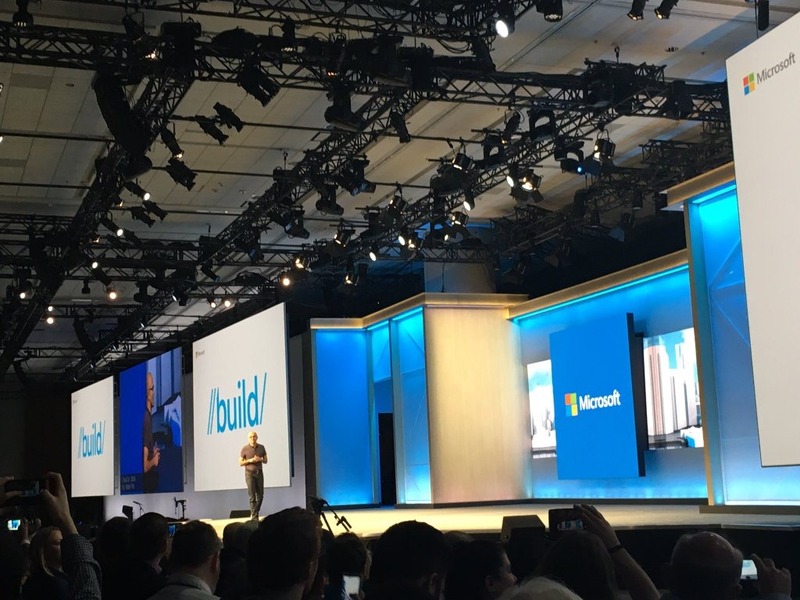 Two weeks ago, I had an amazing opportunity to be at Microsoft Build Conference in San Francisco and I would like to share my experience about the conference with you in this post by highlighting what has happened and giving you my personal takeaways. Two weeks ago, I had an amazing opportunity to be at Microsoft Build Conference in San Francisco as an attendee thanks to my amazing company Redgate. The experience was truly unique and amount of people I have met there was huge. A bit late but I would like to share my experience about the conference with you in this post by highlighting what has happened and giving you my personal takeaways. You can also check out my tweets for the Build conference. Running Bash on Ubuntu on Windows has been announced. This is not something like Cygwin or anything. It basically runs Ubuntu on Windows without the Unix kernel. So, the things we all love like apt-get works as you expect it to work. This is a new developer feature included in a Windows 10 "Anniversary" update which is coming soon (as they say). You can watch Running Bash on Ubuntu on Windows video, check Windows Command Line Improvements session from Build 2016 or Scott Hanselman's Channel 9 interview on Linux Command Line on Windows. Xamarin in Visual Studio is now available at no extra cost. Xamarin will be in every edition of Visual Studio, including the widely-available Visual Studio Community Edition, which is free for individual developers, open source projects, academic research, education, and small professional teams. You can also read Mobile App Development made easy with Visual Studio and Xamarin post up on VS blog. There is now an iPhone simulator on Windows which comes with Xamarin. This still requires a Mac to build the project AFAIK. Mono Project is now part of the .NET Foundation and is now under MIT License. Visual Studio 2015 Update 2 RTM has been made available to public. You can read more about this on VS Blog. Visual Studio "15" Preview has been made available to public. This is different than VS 2015 and has a very straight forward install experience. 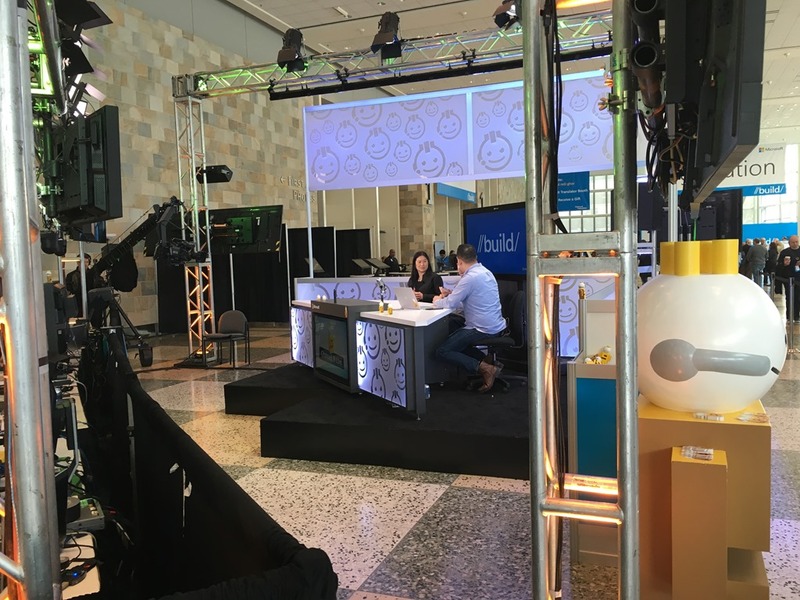 I recommend watching The Future of Visual Studio session or The Future of Visual Studio Channel 9 live interview from Build 2016 or read Visual Studio “15” Preview Now Available blog post if you want to learn more. Related to both VS 2015 Update 2 and VS 15 Preview, see What’s New for C# and VB in Visual Studio post on .NET Blog. You will see mostly features that ReSharper had for long time now. Microsoft announced its Bot Framework. The HoloLens SDK and emulator is now live. Cognitive Services has been announced. This service is exposing several machine learning algorithms as a service and allows you to hook them into your apps through several HTTP based APIs like Computer Vision API. Some portions of this service was known as Project Oxford which was the codename. Try out https://www.captionbot.ai/ which is built on top of these APIs. Azure Service Fabric has stepped outside the preview and is now GA. Microsoft has given a lot of attention to this service throughout the conference, including the keynote (starting from 0:52:42). You can also check out Azure Service Fabric for Developers and Building MicroServices with Service Fabric sessions from Build 2016 for more deep info on this. 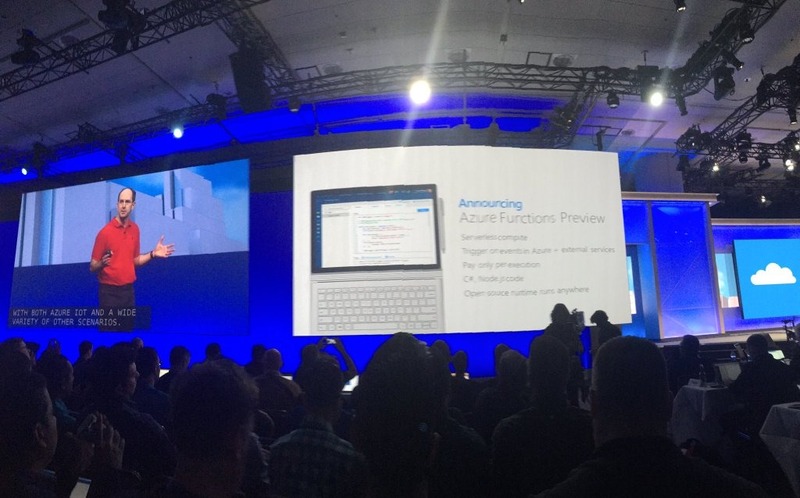 Virtual Machine Scale Sets is now GA.
Azure released a new service called Azure Functions. Azure Functions introduces an event driven, compute-on-demand experience that builds on Azure’s market leading PaaS platform. This is Azure's offering which is very similar to AWS Lambda. You can read Introducing Azure Functions blog post and Introducing Azure Functions session from Build 2016 for more info. Several announcements has been made for DocumentDB, Microsoft’s hosted NoSQL offering on Azure. Protocol support for MongoDB: Applications can now easily and transparently communicate with DocumentDB using existing, community supported Apache MongoDB APIs and drivers. The DocumentDB protocol support for MongoDB is now in preview. This is a very strategic move to make up for the lack of standalone local installation option which is the most wanted feature for DocumentDB. Global databases: DocumentDB global databases are now available in preview, visit the sign-up page for more information. Updated pricing and scale options. Azure IoT Starter Kits have been released. There were many other stuff on IoT part. You can see the official post on Azure Blog for them. Power BI Embedded has been made available as a preview service. 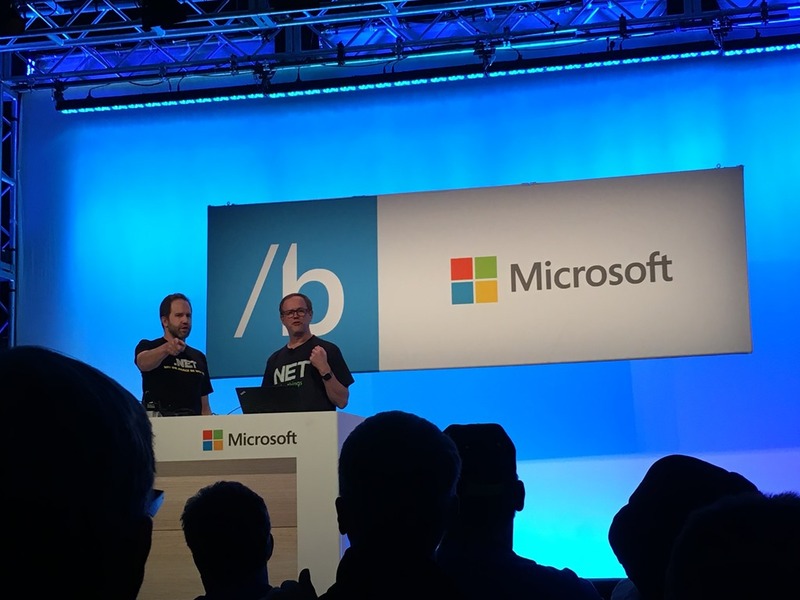 The Future of Visual Studio: It was a great session to watch even if there were demo failures, which were understandable considering the state of the product. Debugging on Ubuntu through VS Preview 15 was my favorite of the session. What's New in TypeScript? : It's always interesting and useful to watch Andres talking about languages. On this session, the part where he talk about non-nullable support on TypeScript was really beneficial. Building Resilient Services: Learning Lessons from Azure with Mark Russinovich: This is like a tradition for build. Mark Rus. talked about architectural and design decisions on Azure platform, mostly driven from real use cases. .NET Overview: Very valuable session to understand the future of .NET. Introducing ASP.NET Core 1.0: Very basic intro on ASP.NET Core 1.0. It is useful to watch if you have no idea what is coming up on ASP.NET Core 1.0. Check the docs, too. Azure Data Lake and Azure Data Warehouse: Applying Modern Practices to Your App: This was a really vague, hard-to-follow session but I plan to watch it again. I find messaging on Data Lake a bit confusing. Deploying ASP.NET Core Applications: Enjoyed this a lot, Dan laid out several cases in terms of deployment of ASP.NET Core applications. The Future of C#: This was really entertaining and informative to watch and see what the future of C# might bring. 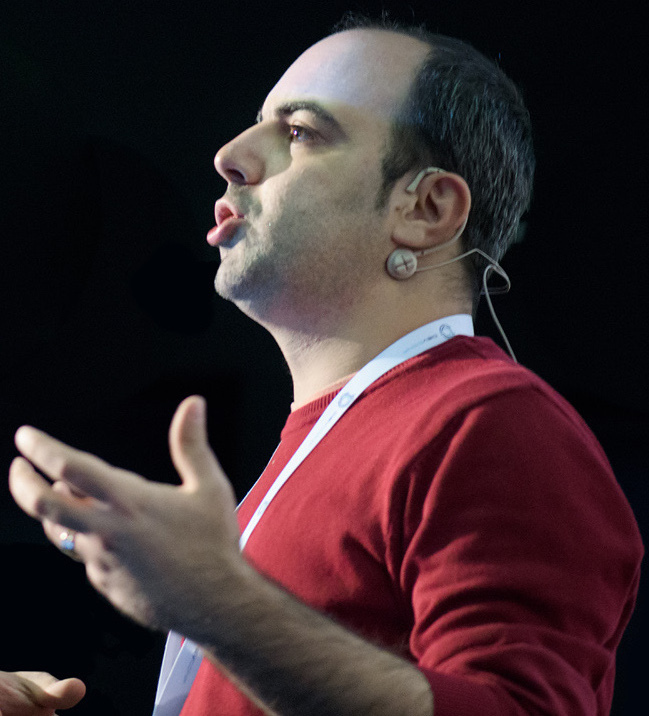 I have seen more from Microsoft to make developers lives easier and more productive by enabling new tools (Bash on Ubuntu on Windows), supporting multiple platforms (Service Fabric to run on every environment including AWS, on-premises, Azure Stack and preview of Service Fabric on Linux), open sourcing more (some parts of Xamarin have gone open source) and making existing paid tools available for free (Xamarin is now free). Microsoft is more focused on getting their existing services together and trying to give a cohesive ecosystem for developers. Service Fabric, Cognitive Services, Data Lake is a few examples of this. .NET Core and CoreCLR is approaching to finalization for v1. After RC2, I don't suppose there will be much more features added or concepts changing. I think this is the first time I have seen stabilization on client Apps story for Microsoft. 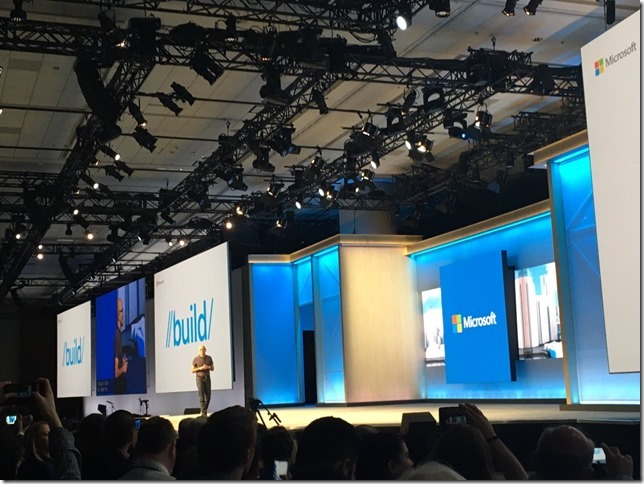 Universal Windows Platform (UWP) was the focus on this area this year and it was the same on previous year. I am absolutely happy to see Microsoft abandoning Windows Phone day by day. There was no direct sessions on it during the conference. There were more steps towards making software to manage people's lives in a better way. Skype Bot Framework was one of these steps. Microsoft (mostly Azure group) invests on IoT solutions heavily. Azure Functions and new updates on Azure IoT Suite are just a few signs of this. Azure Resource Manager (ARM) and ARM templates are getting a lot of love from Microsoft and it's the way they push forward. They even build new services on Azure on top of this.